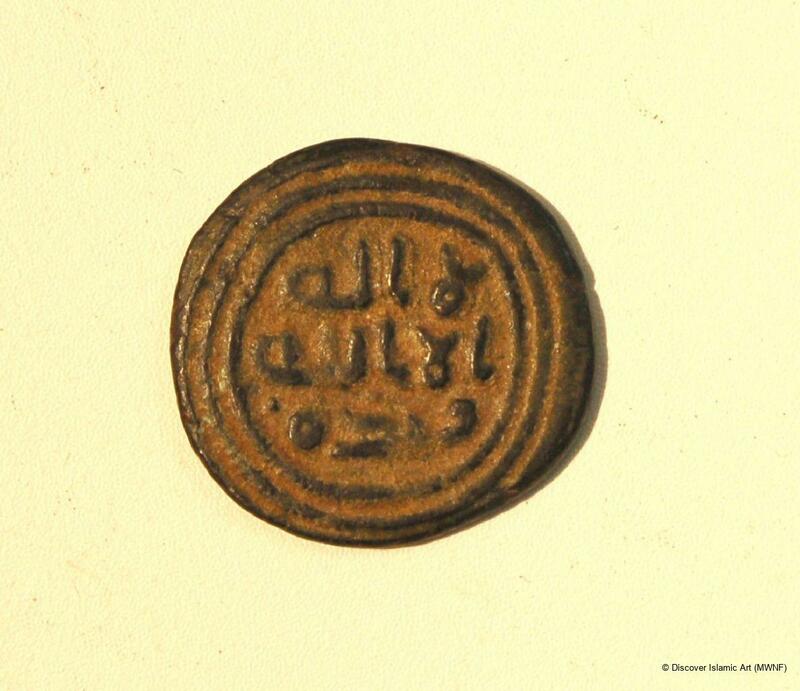 An Umayyad bronze coin (fils) from the period that followed Abd al-Malik's coinage reform of AH 77 / AD 696, distinguished by the formula of the faith, the Shahada, and a purely epigraphic style that incorporated Qur'anic verses. 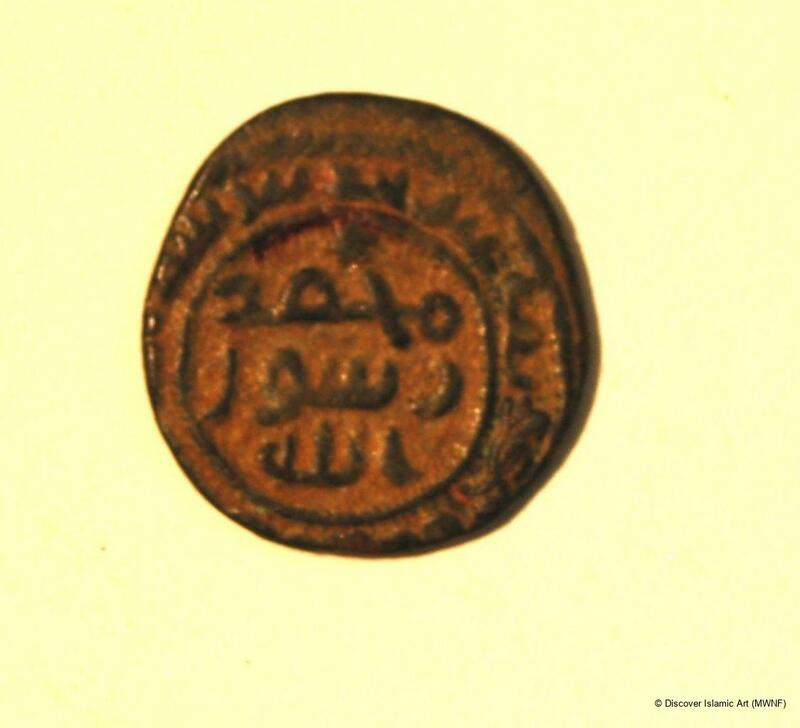 This fils was minted in Jarash, which was part of Jund al-Urdun (one of the five military and administrative provinces in the early Islamic period). On the obverse, within concentric circles is an Arabic legend from the Qur'an written in kufic script that reads from right to left: 'La 'ilaha illa-Allah' ('There is one God; Muhammad is the messenger of God'), which is the second part of the Shahada. On the reverse, within a circle of dots there is an Arabic legend in kufic script that reads: 'Muhammad Rasul Allah' ('Mohammad is the messenger of God'). The marginal legend between two circles reads: 'bism Allah duriba hadha al-Fils bi Jarash' ('In the name of God. This Fils is minted in Jarash'). 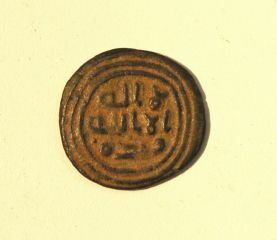 This bronze fils has a kufic legend on the obverse La 'ilaha illa Allah (there is no God but Allah), and on the reverse Muhammad Rasul Allah (Muhammad is the messenger of God) with bism Allah duriba hadha al-fils bi Jarash (in the name of God, this fils was minted in Jarash). The name of the mint 'Jarash' appears only on bronze coins minted during the Islamic period of the Umayyads and stops with the fall of the dynasty. Also, since representational images are replaced by epigraphic inscriptions on this coin, it was minted after ‘Abd al-Malik's administrative reforms of 77 / 696–7. The object was purchased from an antiquities dealer in 1998. Provenance for this coin is established by the inclusion of the mint name 'Jarash' in the inscription. القسوس. نايف، نميات نحاسية أموية جديدة من مجموعة خاصة: متحف البنك الأهلي الأردني للنميات، عمان، 2004، ص.394. Naghawy, A., "Umayyad Filses Minted at Jerash" in Jerash Archaeological Project 1984–1988, Vol. II, Paris, 1989, pp.219–20.